For all Group 0 infant car seats and pushchairs. Waterproof, breathable fabric and very warm. It’s 65 x 38 cm approx. and can be used with 3 or 5 point harnesses. The cover can be completely removed leaving a seat liner, while the cover can also be used as a pram quilt. Fits very easily due to the large rear opening that allows you install it without removing the harnesses. Polyester or Nylon and Protected by Scotchgard™ depending on colour. Universal, for all Group 0 & Group 0+ infant car seats and/or pushchairs. Suitable from birth to 18 months approx. Fits very easily due to the large rear opening that allows you install it without removing the harnesses. Dimensions: 65 x 38 cm approx. Removable cover to convert into a seat liner. Can be used with 3 or 5 point harnesses. Especially available to co-ordinate with your Jane pushchair. Jane UK Replies: Hi Allana, this footmuff is actually pictured on a Matrix Light 2, just like yours. 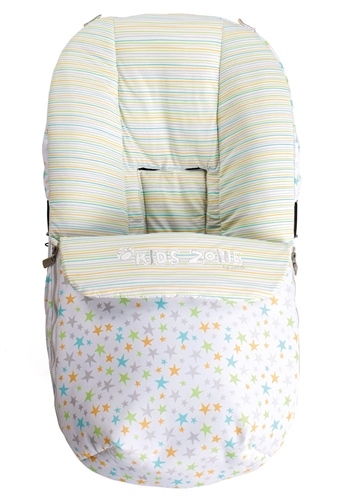 It is designed with easy Velcro back openings to attach a car seat harness through. So it can be used safely in the car seat as baby is still strapped in. It would help pad out the seat if that is your issue, and the apron part can also be removed so it can be a liner. Hope this helps.